“Stand up!” shouted Chief Boatswain’s Mate Everett Owl. The ten heavily laden young SEALs struggled to their feet. We were all burdened with bulging rucksacks and rifles in addition to our main parachutes and reserves and there was little space inside the cramped C1-A twin engine Navy prop plane. The seats had been removed so we had hunched on the floor during the half hour flight to the Suffolk, VA airfield. For most of us this would be our first jump with the Team after just graduating from the US Army’s Airborne school at Ft. Benning, GA. The five jumps down there had been mass affairs out of C-130s with long sticks of jumpers hustling to get out the door. No time to think about much of anything. This was different. “Hook up!” Owl screamed above the roar of the engines. We dutifully snapped our static lines to the cable stretched down the length of the overhead. It was pitch black outside and the only light inside the aircraft came from the red lights mounted on the forward bulkhead. “Check equipment!” Each man turned to the man next to him and checked the belts, straps and buckles to insure everyone was properly harnessed and secured. Despite the air rushing in the black hole of the open door, the air carried the distinctive redolence of “fear farts”. Of course, none of the jumpers would ever admit to letting any of this nervous gas loose, but one would have to conclude it wasn’t the pilots who were visible through the open door to the front of the plane. Chief Owl served as jump master on this flight and had the responsibility of deciding when to exit the aircraft. The pilots would turn the red lights to green when, in their estimation, we were over the airfield. Owl crouched in the open door looking out while the rest of us stood tightly bunched ready to rush to the door and jump. The green lights came on and I tensed waiting for the order to go. Owl leaned back inside the plane and pushed the first man back. “Don’t move.” He then leaned forward and shouted at the pilots, “There’s no f***ing air field down there!” A heated debate between Owl and the pilots ensued, although I could hear none of it. Owl ordered us to unhook and sit down as the plane banked into a circle. After several minutes Owl had us on our feet again ready to jump. On came the green lights and again Owl had us sit down as he got into a rather spirited conversation with the pilots. Around we went again. As you might expect, this had some deleterious effect on my confidence level. I did not know Chief Owl, however, I was inclined to trust him more than two pilots I had never met. A pilot once told me that ‘only a fool jumps out of a perfectly good airplane’ so I have never been convinced that they have my best interests at heart. I looked up and saw Owl, now crouched between the pilot’s seats, pointed off in the distance and the pilots were nodding in agreement. Owl returned to his charges and got us on our feet again. After several long minutes Owl urged us out the door and we launched ourselves into the night. My chute opened with a sharp and gratifying tug on my harness. I let out a huge sign of relief for: 1. My parachute was open and, 2. I did not relish the prospect of riding a reserve chute down with all this equipment strapped to my body. Floating down in the faint moon and starlight seemed tranquil and refreshingly quiet after the deafening noise of the aircraft. I relaxed. 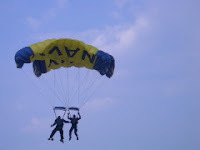 At the time we used the flat T-10 parachutes i.e. they had no steering capabilities. The only way to steer the thing was to haul in the risers on one side, essentially tilting the canopy and spilling air out of one side. This gave you some sideward movement but also increased your rate of descent considerably. 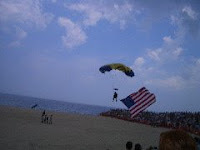 When I got about halfway down I could see that the slight breeze would carry me into the middle of a concrete runway. You often hit pretty hard in those old parachutes, especially overloaded with equipment and I did not relish the prospect of hitting solid concrete. I preferred the grass on either side so I took up a slip to try to get over the runway. As I neared the ground the breeze vanished and I could see that a concrete landing was inevitable. I let out the slip to slow me down and reviewed the requirements for a perfect “parachute landing fall” as the Army called it. Feet together, knees bent, arms overhead grabbing the risers, eyes front. Check. I waited. Nothing happened so I looked down. Mistake. Crash! Looking down caused me collapse forward instead of backwards or to the side, meaning that my head and elbows took the brunt of the landing. Fortunately, I am Irish and have a hard head. The elbows are not so genetically protected and the resulting chips in them have been a constant reminder ever since. I will offer some other parachuting stories in future posts. Ouch! I must admit that the thought of parachuting for fun makes me ill. I'm too clumsy to be a thrill chaser.